It’s exciting to have a book review walk-through of my 1st book! 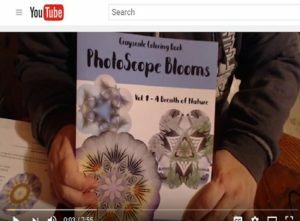 Cindy Howard of Dan-Cin Art Studio graciously spent about 8 minutes showing and telling on video about the features of the first in my grayscale coloring book series, PhotoScope Blooms, Vol. 1 – A Breath of Nature. To purchase the ebook version you can print yourself on your favorite paper or card stock, go to Etsy HERE. To get a FREE sample of the book, BEFORE you buy, go HERE. P.S. Go ahead, try before you buy! Get your FREEBIE HERE.